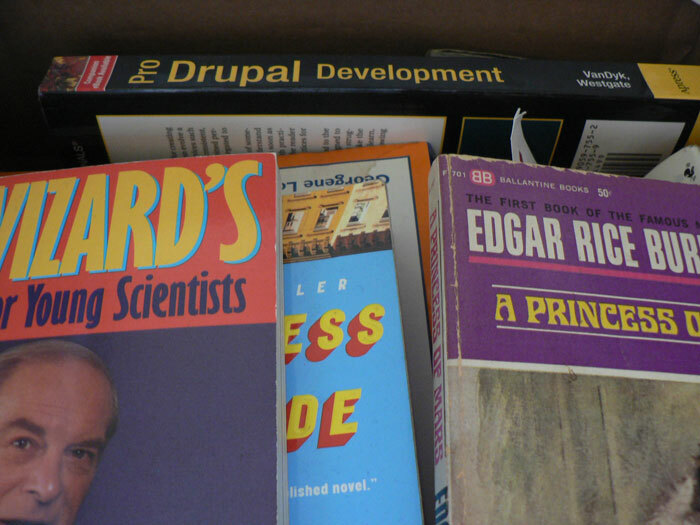 Libraries are storage repositories for books, but just certain books, not your books. No, you have to store those yourself. Most of the time, those books are speed bumps or structural elements because most of the time you aren’t reading them. While a well-stocked bookcase or two can be good for showing off to friends and potential mates when you have them round the place, there’s something to be said for not having a half ton of dead tree hanging about the place, taking up valuable space that could be used for holding broken electronics or a knife throwing range. See where I’m going with this yet? Two things about me: I’ve got no money and I live in what would be considered a treehouse if it was in a tree, rather than over a store that sells do-rags and tire chains. Thus I think a lot about making use of the limited space I’ve got and keeping myself stimulated without laying out a lot of cash. Add that to my nerdish tendencies and it’s a no brainer that I have a pretty steady relationship with the local library. I took a big box of books down there yesterday to donate after cleaning out the apartment. (My New Year’s resolution had something to do with house guests not getting tetanus) They thanked me, dropped in a coat closet and would presumably be storing them until they can be bought at some semi-annual sale by other people who will also use them to clutter up their apartments. So I got thinking: what if we applied out internet age expectations of resource sharing to Dead Tree Media? What would that look like? Now a library is an old, old approach to a problem that doesn’t really exist anymore: books being rare, expensive and the only way to reliably preserve and transmit the written word. True, it can still expensive to build up a book collection of one’s own, especially if the knowledge you’re after is something that might be captured within the textbook/university publishing ghetto where the writing is dry and the prices are high. These days, libraries are struggling. Cities everywhere are deeply in debt and over budget so they’re slashing funding to everything they can. At the same time, the gushing info pipe that the internet provides has made the modest offerings of the local public library seem less important to those well-off enough to afford their own computer and net access. So how can we rewire libraries to increase their relevance? Well, one suggestion would be to have them work more like cloud storage, crossed with a little bit of file sharing. (yeah buzzwords!) Dig: Libraries could take a patron’s books, either assuming full ownership or holding them for a mutually agreed upon term. Then, the patron would be able to get them back at any time, provided no other library patron has checked them out. Donating patrons would have priority on retrieving any books they donated (i.e. : could skip ahead of the line if an item was heavily reserved) and donated books would be stored in their donor’s home branch, keeping them nearby most of the time. The donor gets imperfect access to his books but for most books, who needs them right at hand 24/7? I could certainly wait a week if I ever got the yen to read Glamorama for the third time. Downsides would include the additional cost for libraries to absorb many many more books. This could be partially offset by requiring patrons to pay a fee upfront for storage of their books within the system. I’d gladly pay 10-15 cents a book to have it nearby but out of my apartment. These payments could also be credited in-kind to a patron’s account to reduce their overdue charges or pay off future fines. Another downside would be a significant hit to sales for book publishers. If libraries were suddenly flush with free books, they wouldn’t have to spend as much. Likewise, such a system could encourage less people to actually buy popular books if they knew that it was sitting there for free at their local library. All in all, not perfect but worth a shot. Thoughts? How would you rewire your public library?